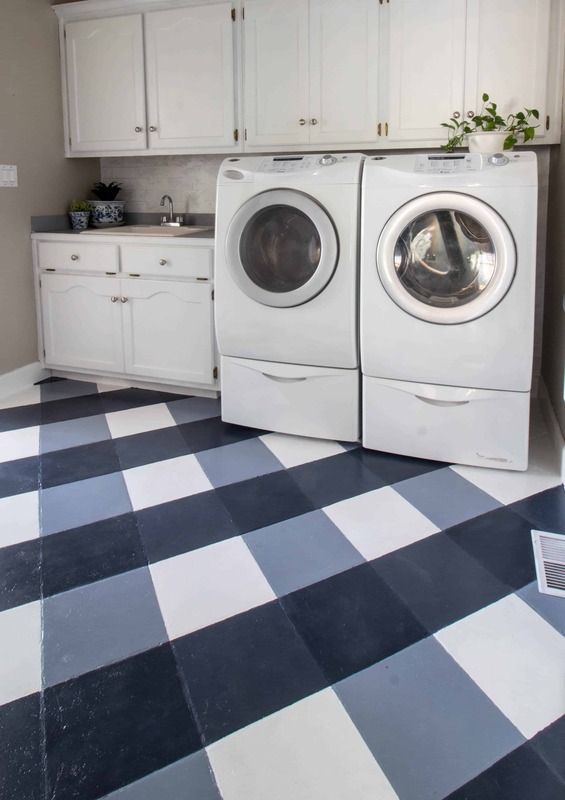 This is how I painted a buffalo check floor pattern and it looks so good! 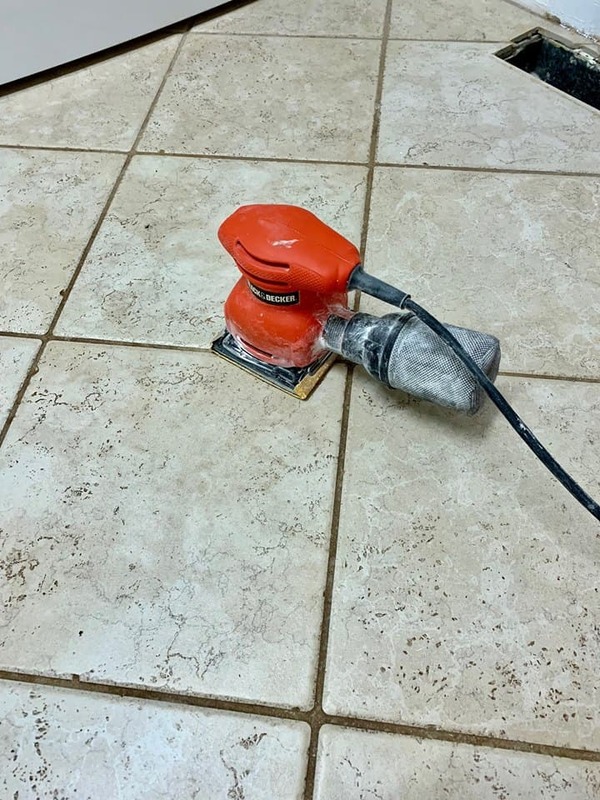 This is an inexpensive way to update a floor when you are not able to add new flooring. My floor was over 10 years old and it was in bad shape. 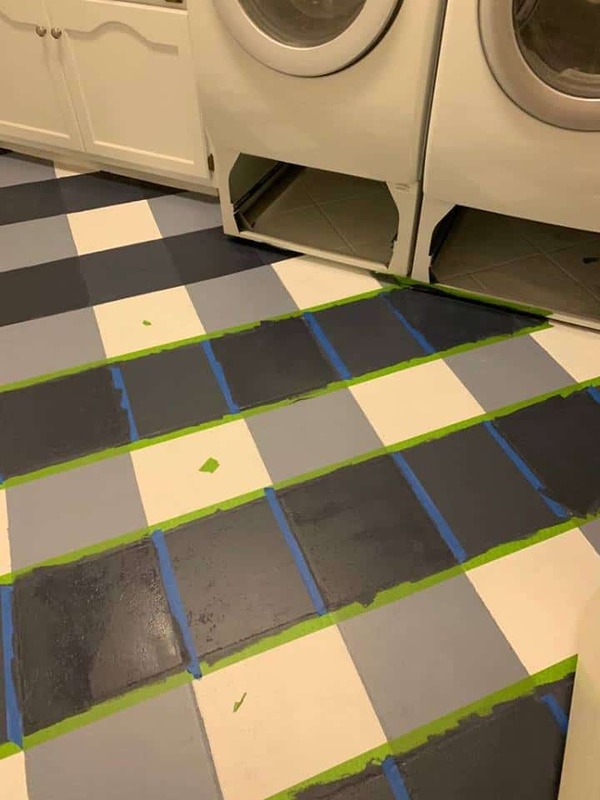 I know that I am going to have to have a new floor eventually but maybe I can put it off for a while by painted the floor. I have seen this project done many times from people I follow on Instagram and they have said that it has held up well. 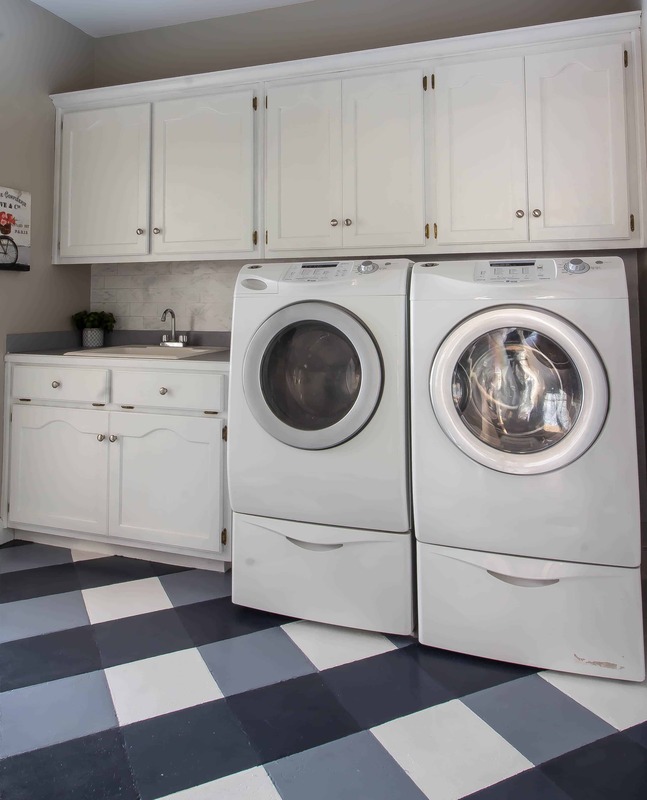 Even Better Homes and Gardens has shared this project. I was in a challenge called the $100 Room Challenge where we are challenged to makeover a room without spending more than $100. 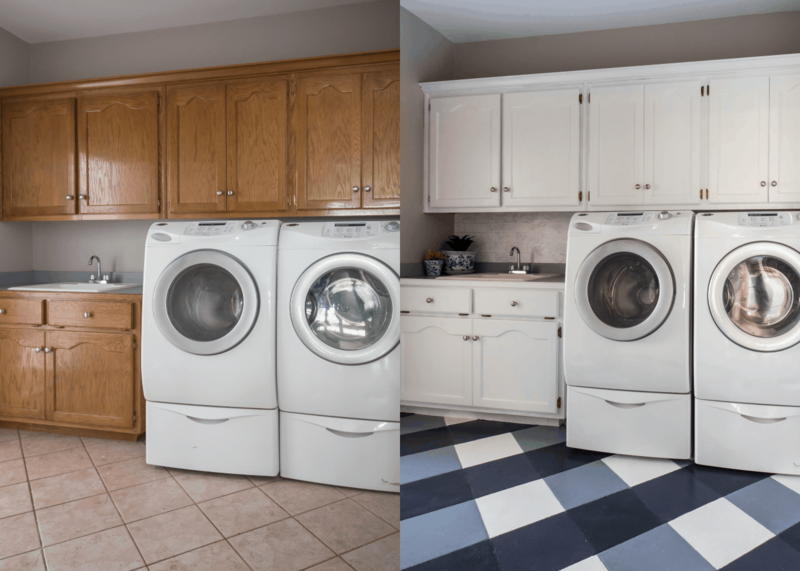 I thought this would be a great time to paint the floor because it is such an inexpensive way to update a floor. The picture above is before I started the project and after. I spent around $40 for this entire makeover and that was for the floor paint. I researched which type of paint would be best. 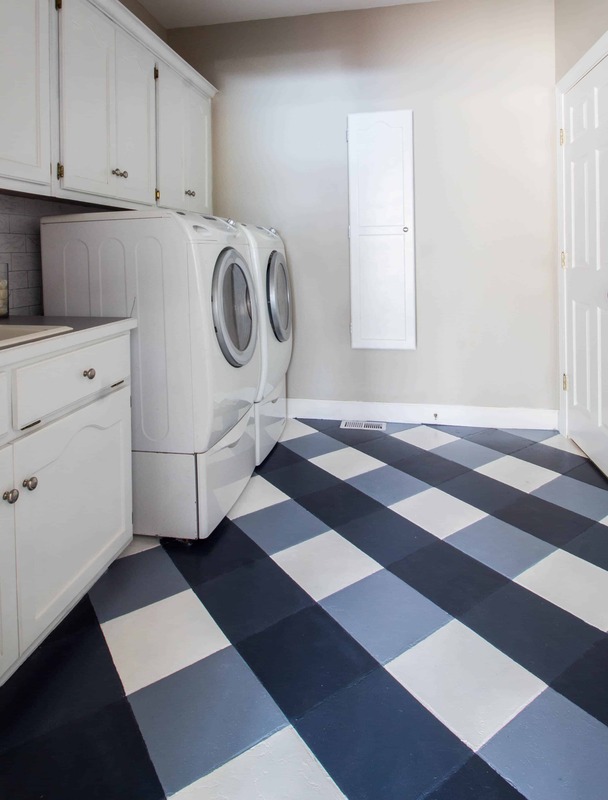 I have seen many people use chalk paint but I am very concerned about my washer shaking and scratching the floor. 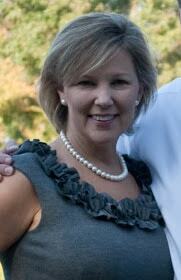 Erin from Lemon’s, Lavender, and Laundry used Porch and Patio Paint and it is also made for concrete. Since my tile is natural stone, I thought it would be the best for my floor. I also asked the workers in the Home Improvement store and that is what they recommend. You need four colors. You need a light color which I used white. You need your dark color and I used Hale Navy. You need two colors in the middle of the paint chart. I needed a light blue and medium blue. I just mixed my light color, white, with my dark color, Hale Navy, to make light blue and medium blue. The only reason I did this was to save money and it worked out fine. Honestly, the hardest part of the project is figuring out how to paint the pattern. I found a great video from Ace Hardware and I recommend watching this video before you start. It explains the process better than I can but I want to share some tips I learned from doing this project. I sanded the floors with a 220 sandpaper with my sander but you could use a block sander also. 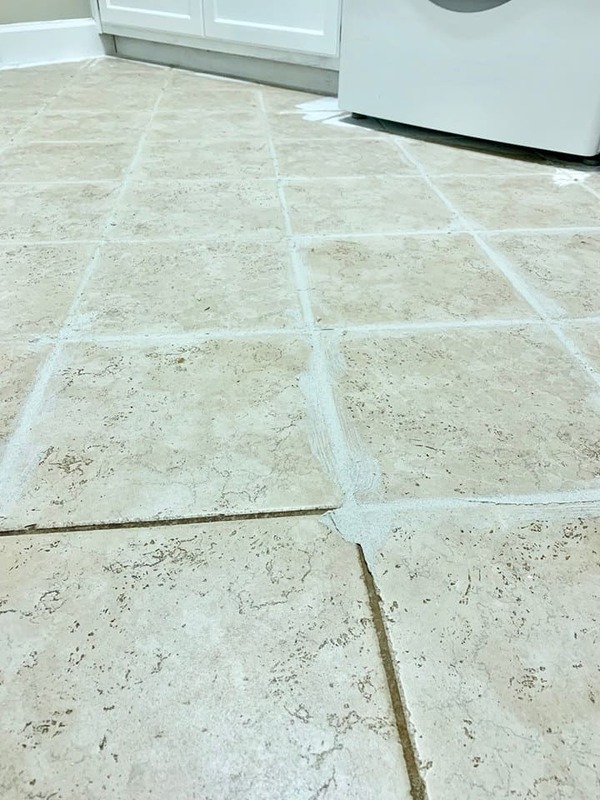 I really disliked the way dirt would get in the grout space so I filled the space with a flexible grout filler plus I wanted the floors to look smooth. You could use premixed grout. I used the flexible filler because that was recommended to me at the store. It works well but it takes longer to harden than the package says. It took over 24 hours. I have painted marble and stone before and the most important step is the primer. I love Glidden Gripper Primer because it will adhere to stone so well. I purchased mine at the Home Depot and the employee also recommended me using this primer. I learned something important from Erin at Lemon’s, Lavender, and Laundry. 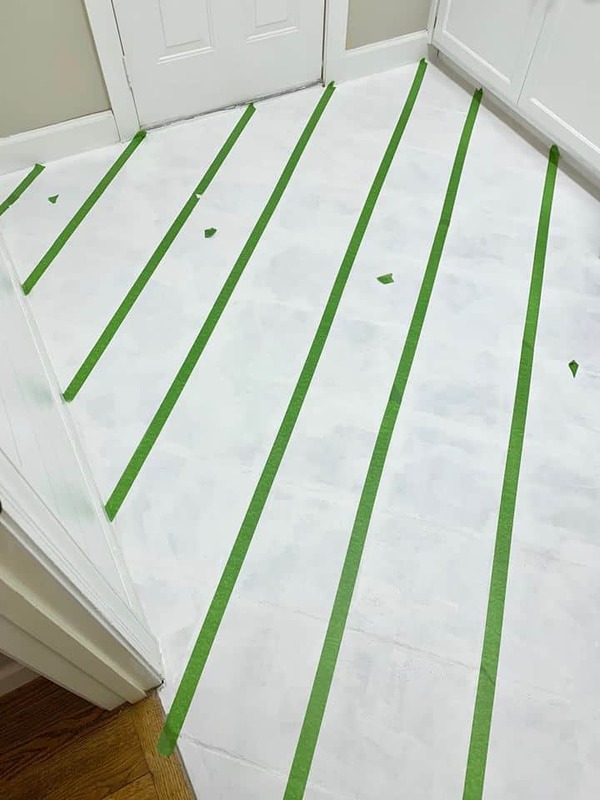 After you prime your floors, you need to wait until the primer cures before using your floor paint. I waited several days because I wanted the primer to really stick to the floor. The Porch and Floor paint is extremely thick and it dries super fast. I have never painted with anything like it and I feel it will hold up well. Be sure the paint is dry before you paint the next rows. 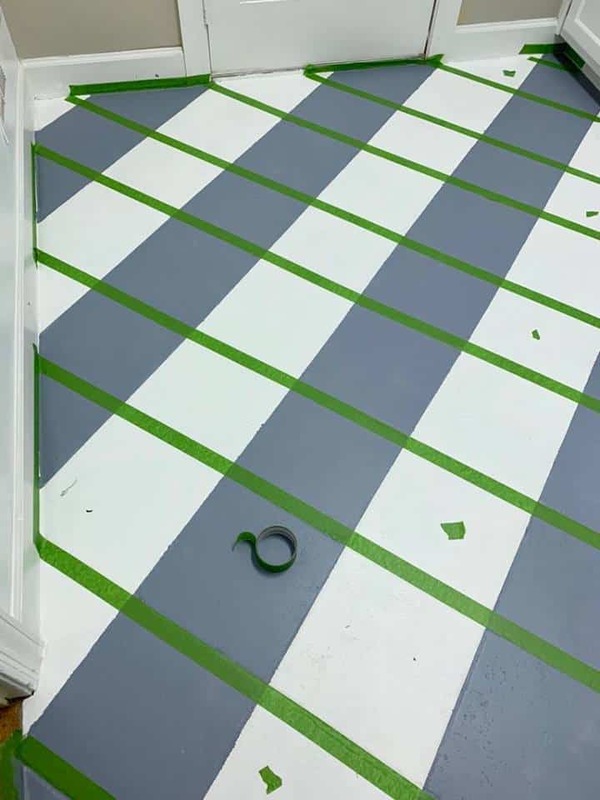 I highly recommend this painters tape for this project because it doesn’t bleed if you press the tape down well. I did as the Ace Hardware video said and painted my lightest color first which was white. TIP: I placed a piece of tape on the rows that I was not painting yet so that I would not accidentally paint that row. I painted the other rows with light blue and I placed the piece of tape on the rows that would not be painted. Let the paint dry overnight before you paint in the other direction. Paint these rows with your medium color paint. 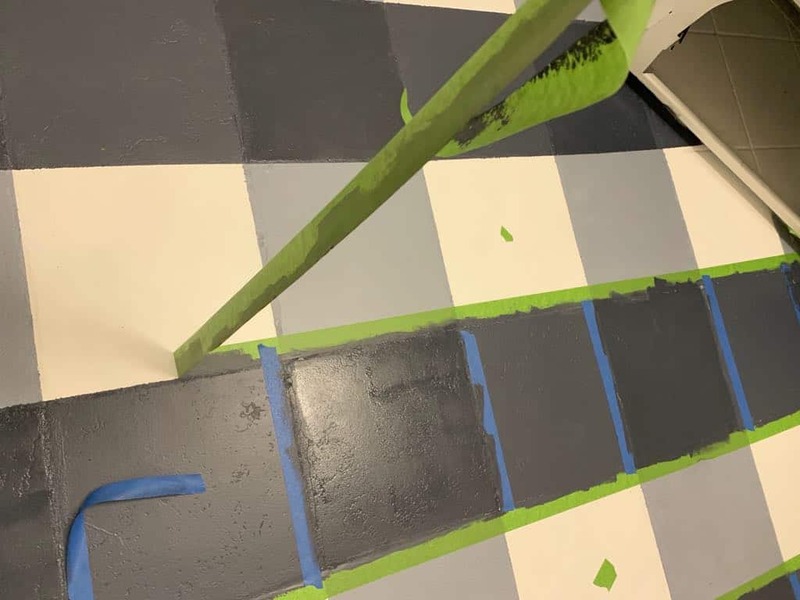 Use painters tape to block off the darkest square. It is the square where your light and medium squares cross. This row will not use as much paint because you are only painting the square instead of the entire row. Touch up any errors that you have with the same color paint. 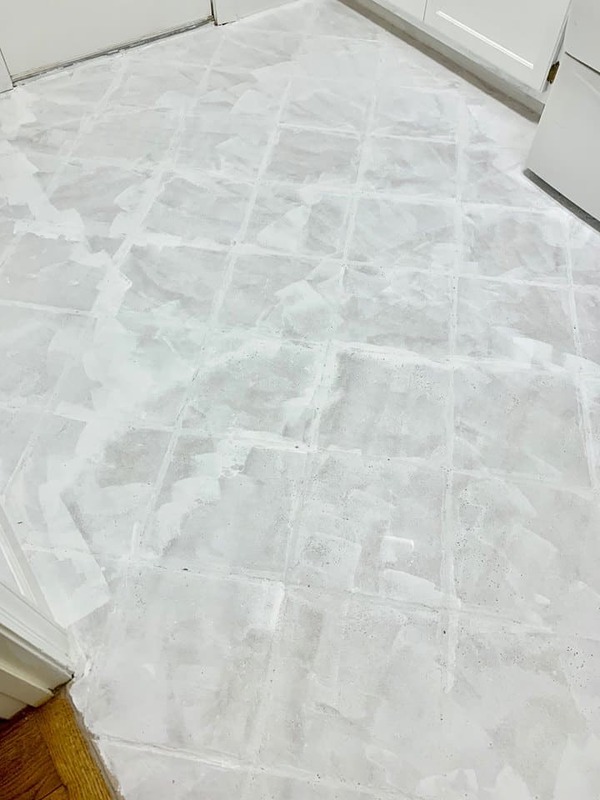 This is how I painted a buffalo check floor and I will update with how well it is holding up. 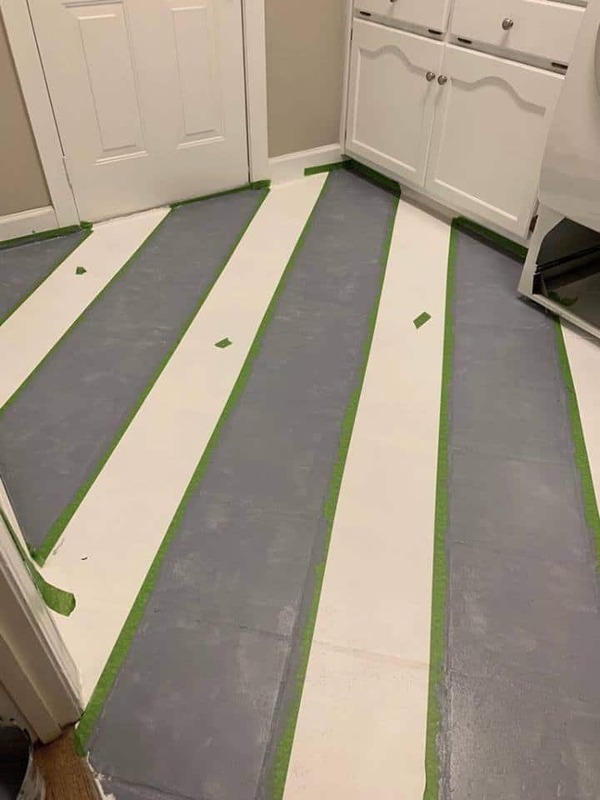 I did talk with someone who used this paint 6 months ago and her floors have held up well.